This is an opportunity to offer spiritual consolation for people we miss, departed loved ones, ancestors, cultures and all we hold dear. 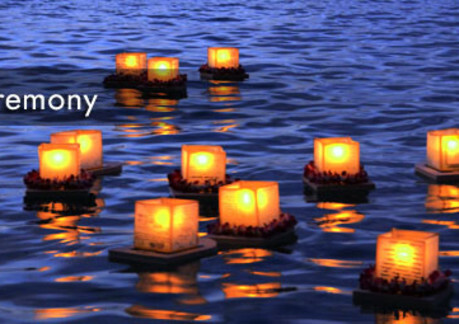 Saturday Time: 7:30 - 10 p.m.
* Make a lantern at the Farmers Market from 9 a.m. to 1:30 p.m.
Everyone is invited to attend the 37th annual Arcata Lantern Floating Ceremony and witness the launching of lighted lanterns on the lake. Except for handicap spaces, there will be no vehicle access to the parking lot at Klopp Lake. Visitors are encouraged to walk, bike or ride a shuttle van from the parking lot at Samoa and I Streets or the Arcata Marsh Interpretive Center parking lot on South G Street. A Friends of the Arcata Marsh guide will lead walkers from the G Street location at 7 p.m. and will guide people back at the conclusion of the ceremony. Lanterns can be made on the day of the ceremony from 9 a.m. to 1:30 p.m. on the northwest quadrant of the Arcata Plaza during the Farmers Market. The City of Arcata’s Nuclear Free Zone Committee began the traditional ceremony 36 years ago to commemorate the U. S. atomic bombing of Hiroshima and Nagasaki in 1945 and to affirm our dedication as a community to the cause of peace. In recent years, the meaning of the ceremony has grown to include the original, ancient Japanese custom of floating lanterns to honor the memory of departed loved ones. Sponsors of the event now also include the GI Rights Hotline, Humboldt Buddhist Peace Fellowship, Humboldt Friends Meeting (Quakers), Humboldt Unitarian Universalist Fellowship Social Action Committee, Veterans For Peace Humboldt Bay Chapter 56, U.S. Servas, and the Women’s International League for Peace and Freedom.